First it was a media sensation. Then it became the #1 international bestseller A Long Way Home . Now it's Lion , the major motion picture starring Dev Patel, Nicole Kidman, and Rooney Mara--nominated for six Academy Awards! 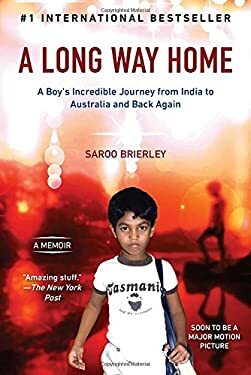 This is the miraculous and triumphant story of Saroo Brierley, a young man who used Google Earth to rediscover his childhood life and home in an incredible journey from India to Australia and back again... At only five years old, Saroo Brierley got lost on a train in India. Unable to read or write or recall the name of his hometown or even his own last name, he survived alone for weeks on the rough streets of Calcutta before ultimately being transferred to an agency and adopted by a couple in Australia. Despite his gratitude, Brierley always wondered about his origins. Eventually, with the advent of Google Earth, he had the opportunity to look for the needle in a haystack he once called home, and pore over satellite images for landmarks he might recognize or mathematical equations that might further narrow down the labyrinthine map of India. One day, after years of searching, he miraculously found what he was looking for and set off to find his family. A Long Way Home is a moving, poignant, and inspirational true story of survival and triumph against incredible odds. It celebrates the importance of never letting go of what drives the human spirit: hope. New (88 available) BRAND NEW. Over 1.5 million happy customers. 100% money-back guarantee. Make your purchase count: support Better World Books' worldwide literacy partners.